When it comes to the manufacture of iron oxide pigments, Lanxess continues to optimise its global production network. There is a continuously rising demand for high-quality pigments which offer good dispersion characteristics. As such they have increased product availability for their customers. Through targeted “debottlenecking” at the Krefeld-Uerdingen site, the specialty chemicals company has increased the product availability of its Bayferrox and Colortherm micronized red pigments by more than 5 000 metric tons per year. Due to their properties, micronized iron oxide pigments from Lanxess are mainly used in technically demanding paints and coating systems and for colouring plastics. The micronization process is characterised by intensive milling in which the proportion of agglomerates is significantly reduced. Micronized pigments can thus be more readily dispersed. In addition, they provide high colour strength and colour consistency. 1. Micronized red pigments from the Laux process have the highest milling stability. Even when subjected to high shear forces during the dispersion process, they show excellent resistance to colour change. 2. These pigment types also lead in terms of temperature stability. They are thermally stable even up to temperatures of 800°C, while red pigments (hematite, Fe₂O₃) produced using other manufacturing processes are typically only resistant up to a maximum of 400°C. Due to the high temperatures applied during calcination in the Laux process, all water inclusions that can promote a colour shift are displaced from the oxide crystal lattice. For this reason, micronized red pigments from Lanxess do not display a colour shift in use, even at extremely high application temperatures. The demand for these products is a clear indication that these pigments play a pivotal role in the painting and coatings industry. 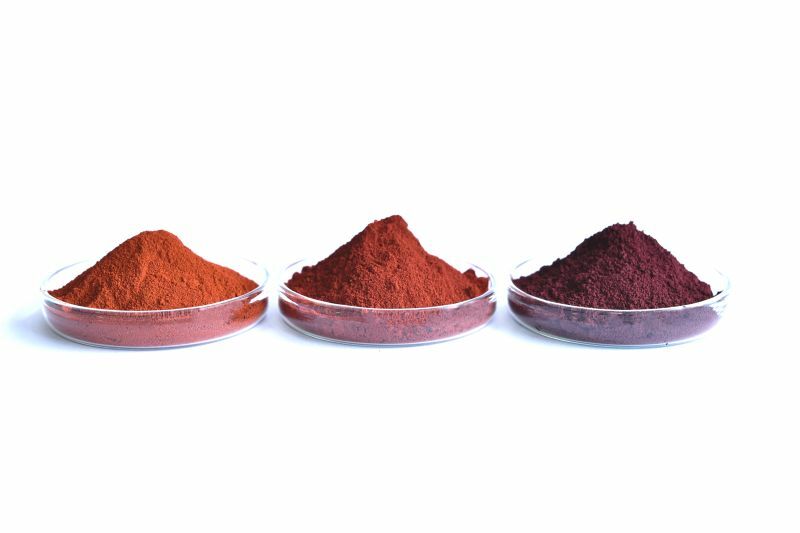 Lanxess micronized iron red pigment offers good dispersion characteristics.